Asianic FDAS solutions provider Metro Manila, Philippines, Asianic FDAS solutions provider Manila, Asianic FDAS solutions Philippines, Asianic FDAS provider Manila, Asianic FDAS provider Metro Manila, Asianic FDAS provider Philippines. Asianic FDAS Manila, Asianic FDAS Metro Manila, Asianic FDAS Philippines. 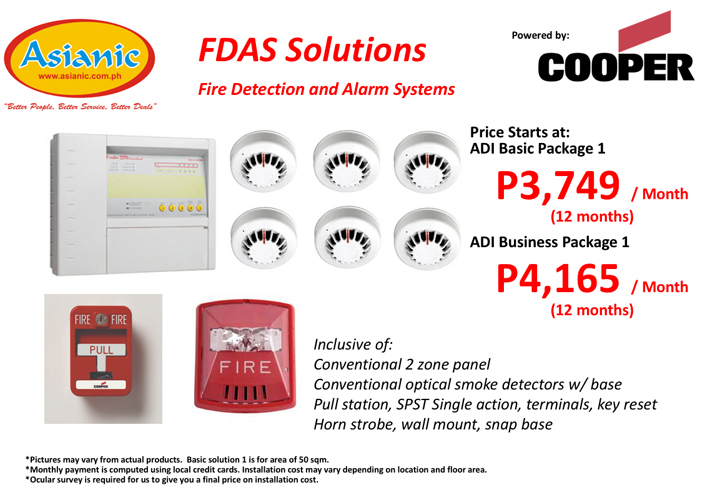 Asianic Fire Detection and Alarm Manila, Asianic Fire Detection and Alarm Metro Manila, Asianic Fire Detection and Alarm Philippines. Asianic FDAS. 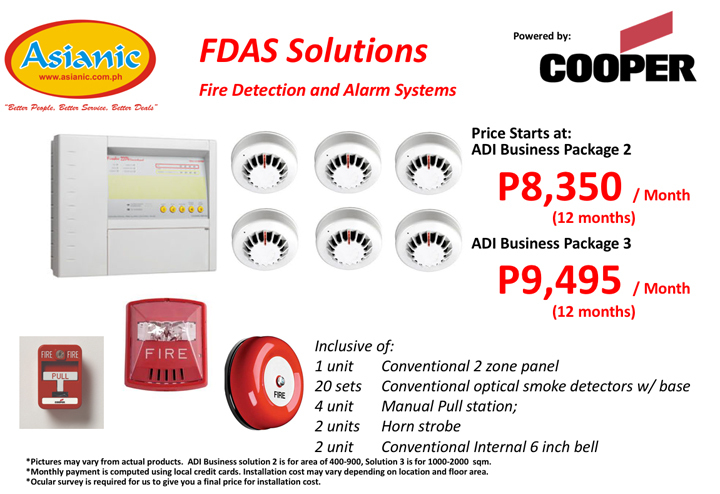 Fire Alarms, Manila, Fire Alarms Metro Manila, Fire Alarms, Philippines. Design and installation of a fire detection system can often be a complex process, with each project often bringing its own challenges in making sure the system is compliant, reliable and easy to operate. Our team of engineers will partner with your project management team using our expertise to meet the specific requirements of your project. The philosophy of a conventional system revolves around dividing the building into a number of areas called zones. The detectors and call points within each zone are then wired on a dedicated separate circuit. In the event of a detector or call point being triggered, the panel is able to identify which circuit contains the triggered device and thereby indicate which zone the fire alarm has come from. The indicated zone can then be manually searched to locate the triggered device. With this type of functionality a conventional system is best used in smaller builds where it wouldn’t be difficult to locate the triggered device in a given zone. 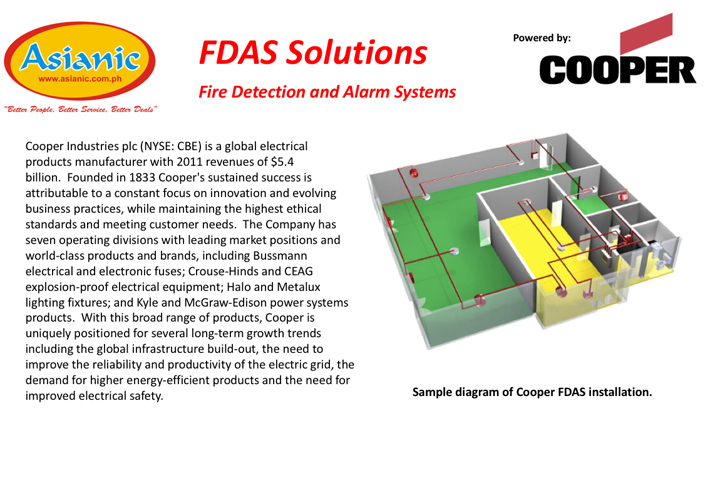 Intelligent addressable systems overcome the limitations of conventional systems as each fire detecting sensor or call point is electronically coded with a unique identification or 'address' which is programmed into the device during installation. By using each devices' unique address, the control panel is able to conduct two way communication with any of the addressable devices connected to the system. Under normal conditions the control panel continuously interrogates each device in sequence and analyses the reply to determine the status of each sensor or call point. The panel checks whether each device is functioning correctly and also the amount of smoke or heat that the device is currently sensing. With the functionality of being able to pinpoint exactly which device is being triggered in an alarm or for a fault, addressable systems are perfect for mid to large size builds with multiple rooms and floors.